We are putting the Lenovo IdeaPad Yoga 13 through its paces, and before we bring you our comprehensive final review, we thought we'd give you our early observations, in the form of a video review. This is certainly an ultrabook, and then some. We saw one of the ways an ultrabook can morph into a different form factor with the Dell XPS 12 ultrabook. The convertible bit was the part where the display can swivel inside its own frame, flip over and lay down over the keyboard to make it look like a tablet. The second is this – the Lenovo IdeaPad Yoga 13. On the outset, this is pretty much the conventional ultrabook as we knew it. But it does a lot more. First up, is the ultrabook/laptop mode that we all have come to know over the years. The screen flips over on its head in the case of the Yoga 13, so you can flip it back and have the Yoga 13’s display looking at you while it sits on the keyboard. Push the display slightly back, and you can have it sitting on the lid on one side and the base on the other side, in a sort of tent mode. And then, push the display completely back, and you have what can be called the tablet mode. All this sounds rather interesting, considering there is a lot of flexibility. But there is one slight problem. The keyboard is always open to external elements, when kept in anything other than the conventional laptop mode. Even when holding it as a tablet, your fingers are essentially gripping on the keyboard. While any key press will not spoil your work, since it is deactivated, but there is a significant amount of risk of damage to the keys. That aside, the build of the Yoga 13 is quite good. The materials used are fairly good quality, and the use of a layer of leather on the keyboard deck gives it a rather unique look and feel. Unfortunately, the keyboard itself could have done with a bit of solidity, because it tends to dip quite a bit when you are typing anything more than gently. For a machine that costs above Rs. 80,000, that is a turn off. The performance of the Yoga 13 is very good, and it matches the XPS 12 in system benchmark tests. The battery life on the Yoga 13 is impressive, and it is now the leader in terms of the longest backup time – just a little more than 5 hours. Essentially, for someone using this at work or for the day long schedule at the college, this will last 8 hours with ease. In real life usage scenarios, the 128GB SSD is very quick, and the same tasks feel slightly snappier than the one on the XPS 12. 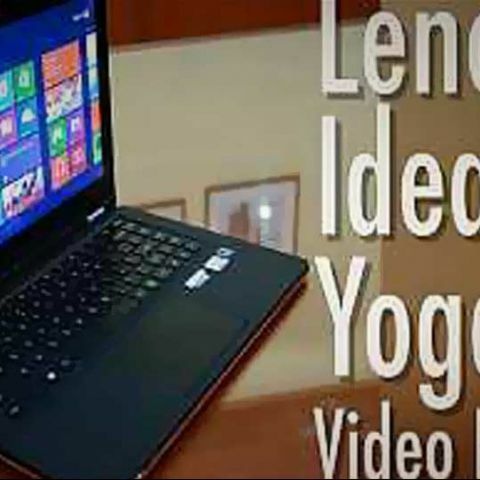 Lenovo has powered Yoga 13 with an Intel Core i5-3317U (Ivy Bridge) processor, which is paired with 4GB of RAM. The cost of this machine is Rs. 84,290. We have a detailed text review of the IdeaPad Yoga 13 coming up very soon. In the meantime, you can check out the video review of this machine.